Dear old Gone showed up at our door the other week. He’d just been released from prison, where he’s spent the summer. It’s almost an annual event, him showing up in September, homeless, almost like he has a plan to help new Ministry Trainees learn good doorstep skills. He’d thrown his prison release paperwork in the bin and first went to Rev Very Benevolent over in the next tow-un to ours. Rev V-B tried to help Gone find somewhere to live, but sadly the housing group who’d accommodated him before said they wouldn’t take him on. In fact, they’d been about to evict him before he went to jail. The trouble for Gone is that he’s not really a criminal. He shouldn’t really be in jail. He’s a vulnerable and increasingly frail man with a serious alcohol addiction. And he’s enormously annoying and quite scary when he’s in the drink. And then charming and sweet and can talk the socks off anyone who’ll listen. But he’s frightened and anxious about other people, which makes him a pretty dire neighbour. And he can cause trouble and stress when he turns up somewhere boozed up. What he needs is something like an old fashioned asylum, where he’s not allowed out, not allowed alcohol, and not given his own money. He’d spent £75 of his getting-out-of-prison money on a portable dvd player and some dvds. He could have had a couple of nights in a hotel for that. But he’s incapable of spending money wisely and no-one will house him for long. So I guess in some ways he knew what would happen next. Rev V-B contacted me a few days later to say that Gone had been conspicuous by his absence for a few days. And that he’d had a call to say that Gone would be up before a magistrate for another breach of his ASBO. So it looks like the prison service is once again expensively accommodating a vulnerable man who doesn’t fit in the system. And maybe it’s the only way that will work for him. It does seem crazy though. Pray with us for wisdom to know how to help him in his next foray back into the world a few months (I guess) from now. Gone, our occasional hedge lodger, has been under the hedge for the last couple of nights. Brrrr – very chilly and damp in the fog. He rang the doorbell very drunk on Wednesday evening, but we didn’t chat for long. This morning he was on the doorstep as I took the boys to school and there again when I returned. I was despairing about his housing situation. As usual, he was drinking a bottle of Frosty Jack and listening to a cheap radio on headphones. But he was also mellow and happy. He asked me to take care of his new debit card that allows him access to his benefits. I declined, thinking that he’ll forget what he’s done with it, but I gave him a wallet to keep it safe. Wonderfully, I also found out that he has does have somewhere to live – he’s in a hostel and has his own room. 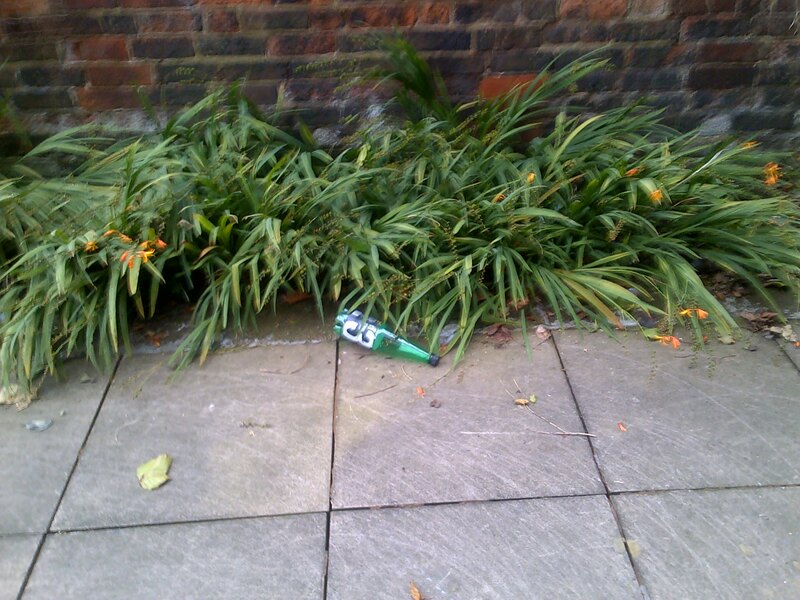 But he’s been too drunk to get himself home the last couple of days – hence the hedge sleeping. I’ve made a note of his address and am hoping we’ll be able to keep an eye on him. And that he’ll manage a winter without prison this year. The needs of the homeless are always complex, and Gone is extremely vulnerable, so I am very thankful that our prayers for him have been answered at last. And am praying that he’d keep it together enough to keep himself housed. He knows that he needs to but the confusion and anger brought by drink and mental illness always means that his home situation is precarious. One of the lovely things about the Midlands Women’s Convention last weekend was the opportunity to catch up with friends from around the region. I was able to have a good chat with another vicar’s wife from the Black Country who has been sharing with us the unusual experience of having Gone sleep under the garden hedge. Mrs Very Benevolent and her husband live in another Sandwell town, just a few miles from here. She told me that Gone has been supplied with a sleeping bag by a local Food Bank and has camped out in their garden for the past few weeks. Another vicar nearby sometimes allows Gone to use his bathroom to spruce up. So he’s surviving. As usual. Mrs VB is finding that Gone is alternately awful, abusive, threatening and foul and then repentant, sweet, thankful and charming. Same mix as ever. But the good news in all this is that the local police have decided that enough is enough and have demanded that the local housing office sort it out. Since Gone is without doubt the most vulnerable person I have ever met, I am thankful that at last some people in authority are taking responsibility. My friend said that the first option will be to get him to Betel, although we all know that Gone struggles with trusting others, so the Betel community may not prove to be the best place. Whatever happens we are praying for a good solution for him. But at last there seem to be people in the ‘system’ watching out for Gone and there will be other options if Betel doesn’t work out. Keep on praying for him – we would love him to to feel secure in a home. Gone was on our doorstep at 6.30am today (Polly heard him, thankfully the Vicar and I were still asleep). He rang the doorbell on and off from 6.55am, but was gone by the time we were all downstairs from breakfast at around 8 o’clock. The Queen’s bedroom is just above the front door and she told me that he was singing loudly about chocolate. There were two bottles of Frosty Jack on the drive. Yesterday we tried to help him get sorted out with the benefits system. He said that noone was able to help him. Gone has forgotten his National Insurance number because he’s suffering from alcoholic dementia. He has no identification documents because he’s lost them all, so is struggling to prove his identity. Without an NI number he can’t claim benefits and therefore can’t even get a place in a homeless hostel. He’s frightened, ill and frustrated. And I don’t blame him. The Vicar let Gone use the phone to speak to the Job Centre that he’s always dealt with, but because he can’t remember his NI number, they were unable to help. You need two forms of identification – you know, utility bills, passport – and he doesn’t have them. Later, after Gone had left, I spoke to our local Job Centre Plus, the West Midlands Probation Service (Gone is less than a month out of prison but is without a probation officer), Walsall Probation office, Sandwell Adult Social Services, Aquarius (the Sandwell alcohol service), a Sally Army hostel, the Birmingham homelessness team, the local housing office and the local emergency homelessness team. Everyone I spoke to was sympathetic and helpful, but were stumped about how to help. The emergency homeless team said they might be able to do a bit more with some more input from him, so next time he’s here in office hours I shall call them so I can mediate for him. In the meantime I’m going to call the central National Insurance office and the mental health services to see if there is any more advice available. At the moment he seems to falling through a hole in a system designed to stop identity theft. He’s not trying to steal an identity. He’s just forgetting his own.